GNOME Shell 3.1.91.1 has been released today and comes with many bug fixes and just one new feature. But this is a really interesting feature: a "browser plugin which will enable convenient installation of extensions from extensions.gnome.org". That means that as soon as extensions.gnome.org will be up and running (right now the link doesn't work), you'll be able to install GNOME Shell extensions with just one click, like Firefox or Chrome extensions. Add a browser plugin - this plugin, tied to extensions.gnome.org, allows users to download and install shell extensions, and enable, disable, and uninstall extensions they already have installed. 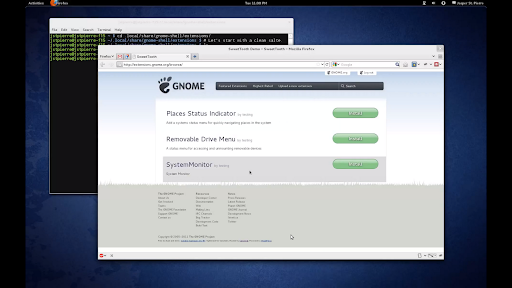 The browser plugin mentioned in the GNOME Shell 3.1.91.1 changelog seems to be for Firefox - at least according to its GitHub page and the demo video posted a while back. But I may be wrong. Unfortunately there's no official info on what browsers are supported or when extensions.gnome.org will be available. More about GNOME Shell and one-click extension install support (project named "SweetTooth") in our previous post: GNOME Shell Extensions To Get A Website With One-Click Install Support.